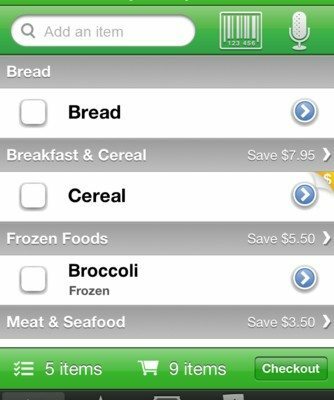 If you have read TheiPhoneMom.com’s other reviews of grocery lists apps, you’ll notice that the apps are all similar to each other, yet each have different strengths and weaknesses. Some allow you to customize multiple lists but do not sync well with other users, while other apps may have a syncing feature but no bar code scanner. Some apps have it all but are not free. Grocery IQ seems to have all the features that we have written about in the past, and, best of all, it is currently a free download. Even as a paper list devotee, Grocery IQ has won a place on my iPhone. Grocery IQ has been around since 2008 and has consistently been a top grocery store app. However, earlier this year they released a new version that many people were upset with. To the developers’ credit, they listened to the complaints and subsequently released a newer version this summer that has brought back many of the features users were upset they lost – including customizable aisles (see below). 1) Lists – Users can create multiple uniquely named lists to use at different stores or different shopping trips. There are also master lists of all items and history items which you can refer back to in order to add to your current list quickly and easily. 2) Database – a database of millions of items, with pictures, to make sure that whomever is shopping knows exactly what you want – no more coming home with the wrong item because your list was not detailed enough! 3) Item details – each item you add to your list is completely customizable with price, description, list selection, aisle etc. even if it is already in the database. 4) Favorites – select items to add to your favorite lists so they are easily accessible. 1.) Tap the List tab to visit list home. This is where you can see your list of lists. 2.) Tap “edit” in the top left corner. 3.) Tap into any of your lists to view settings for that list. 4.) Tap into “change aisles”. 5.) To reorder existing aisles, drag aisles to the correct order. 6.) To create custom aisles, tap the (+) in the top right corner. 6) History: Another way to add to new lists — keep track of what you’ve checked out and filter history by list. Easily create lists from history items. 7) Multi-Barcode Scan: Add multiple items by simply pointing your camera at any product barcodes. This will work for many products, but not all. 8) Voice Search: Use advanced voice search to create your list. This is my least favorite way to add items to the list. It works well when speaking multiple common items like “pretzels, butter, coke” but for slightly more obscure products it has trouble when you ask it to find more than one at a time. 9) Store Locator: Find nearby grocery stores and add your loyalty card. 10) Sync: Sync your lists with the GroceryiQ.com website, friends and family. This is a great feature. I tested this with a fellow iPhone user and added updates while she was shopping. She received them immediately. I then tested it out with an Android user and the app synced seamlessly as well. 11) Coupons: Search free coupons, view recommended coupons, print, email or add coupons to your store loyalty card. As a new Grocery IQ user, I love the features available on this app and think the price is perfect (free!). It really has all the features we have been looking for in grocery list apps over the last few years. Give it a try and let us know what you think. Requirements: Compatible with iPhone, iPod touch, and iPad.Requires iOS 4.2.1 or later.